HAVING BEEN A MUSICAL ICON FOR MORE THAN FOUR DECADES, Cliff proves he's still got what it takes: he still has the great presence of a successful and much-loved performer. EMI were proud to release Love… The Album on 12 November and this new compilation features five new recordings that include a cover of the Leo Sayer classic When I Need You. The magnificent line-up also includes Daniel Bedingfield's upbeat If You're Not The One, Air Supply's All Out of Love, Foreigner's Waiting For A Girl Like You and Ronan's When You Say Nothing At All  all sung by Cliff in a way that only he can. Sitting neatly alongside those tracks are great classic Cliff favourite such as Miss You Nights, True Love Ways and the superbly emotive Some People. Having met Cliff briefly back in the late Sixties and again in the early Seventies  when I attended his live performances  I can say that his personality is very evident on Love… The Album. Born in India in 1944, Cliff appears youthful and vibrant while also dis-playing a casual, laid back attitude. He may look cool, but underneath it all he is passionate about his artistry and is very professional. Next year (2008) Cliff will be celebrating his 50th anniversary in the music business. In 1958 he made waves with his raw teenage energy that was a breath of fresh air and established him as Europe's first authentic rock 'n' roll star. After 49 years, with a staggering 250 million record sales behind him, he continues to delight his fans with new music and spectacular live performances  every one as good as the last. No other British entertainer has spanned the years and the gener-ations more successfully or had more hits all over the world than Cliff. A truly astounding artiste, Cliff has made this album very much his own. 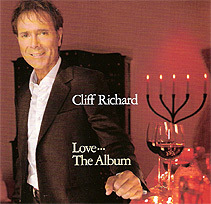  Cliff Richard's Love… The Album was released on 12 November (2007) by EMI. Me | When I Need You* | True Love Ways | The Twelfth Of Never | When You Say Nothing At All* | Ocean Deep | For Life | All Out of Love* | I Still Believe In You | Some People. *New recordings. "To my mind this [If You're Not The One] is one of the best ballads to emerge in the past ten to fifteen years. I really wanted to get my tonsils round this one! "Leo Sayer's song [When I Need You] is a classic, and the difficulty always in covering a classic is to make it fresh and to make it mine. I hope you'll feel I've succeeded. "Ever since I saw Notting Hill, this song [When You Say Nothing At All] got under my skin. How I'd have loved to have played the Hugh Grant role. That was never going to happen, so I've sung the song instead. "I've always been a fan of Aussie bands and Air Supply is definitely one of that country's best exports. For me, All Out Of Love is Numero Uno. "The melodic range of this song [Waiting For A Girl Like You] was a real challenge  even more so as I believe there were two lead singers on Foreigner's original. Double the singers  double the range! Not easy!" EMI Music and The Cliff Richard Organisation announced an innovative pricing model to mark the download release of Cliff's latest album Love… The Album. Cliff Richard fans were able to pre-order the album  which includes special bonus material  from the newly launched www.lovecliffrichard.com. Cliff says of the initiative: "Who'd have thought I'd get a buzz from creative marketing? As artists we face a stark choice. We either keep one step ahead of the technology which is changing our industry so radically  or we throw up our hands and quit. Personally I'm not for quitting!" Steve Davis, Director of EMI Catalogue says, "Because Cliff's audience has not previously been big on downloading we feel this initiative will not only encourage them to download the album but also encourage their friends and peers to do the same because the more they do, the cheaper it becomes." Graeme Rogan, Head of Digital, Sales EMI UK: "There is little doubt that the digital market place has allowed us to consider more varied and exciting revenue models. At EMI we are continually reviewing our digital routes to market and aren't afraid to challenge the existing status quo. The fact that Cliff and his team have embraced the 'price drop' model just shows that more established artists are willing to experiment with their releases and engage with their fans in more varied and innovative ways."